With effect from 1 January 2016, free plastic bags are prohibited in the Netherlands. This measure is intended to combat litter on the streets and in the sea, and prevent wastage of resources. What does the ban on free plastic bags entail for consumers? 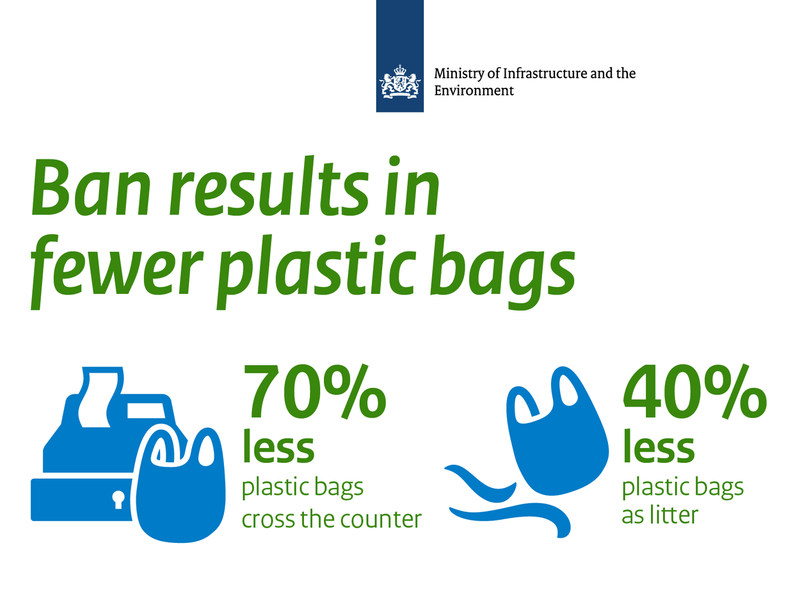 Consumers in the Netherlands altogether used some 3 billion plastic bags per annum. The bulk of these end up in the bin, yet more become litter. For that reason, the European Union has made it mandatory upon all member states to reduce the use of plastic bags. With this ban on free plastic bags, the Netherlands has met this European obligation. In addition, the national government aims to raise awareness among consumers. The ban on free plastic bags may foster sustainable behaviour; for example, by the reuse of bags. In some cases, foodstuffs may still be packed in lightweight plastic bags: if this prevents food from going to waste or if there is no other hygienic way to package such foods. Customers will no longer receive a free plastic bag in the shops, unless their purchase falls within the exceptions. If you would still like a plastic bag, you will have to pay a small amount. Shopkeepers are free to fix the price they charge. The recommended price for a plastic bag is EUR 0.25. More information for shopkeepers: What does the ban on free plastic bags entail for shopkeepers? There are a few exceptions to the ban. In the following situations, consumers will still receive a free plastic bag (under 0.015 mm thick). Lightweight free plastic bags as sole packaging are permitted if they serve to protect foodstuffs against pollution or contamination with pathogens. Examples include unpackaged summer fruit such as strawberries, or unpackaged vegetables such as green beans. Such bags are also permitted in situations in which foodstuffs may become unfit for consumption, for example due to seepage from raw fish, raw meat, or raw poultry in non-sealed packages. In addition, lightweight free plastic bags as sole packaging are permitted to combat wastage of loose foodstuffs, such as loose apples or buns. Fluids, aerosol cans, and gels sold in duty-free shops at airports or in aeroplanes must be sealed in a (clear) plastic bag. Examples include liquor, deodorant, and hair gel. In such cases, the plastic bags are free. The customary fee is charged for other See Buy Fly bags. More information for consumers: What does the ban on free plastic bags entail for consumers? The Human Environment and Transport Inspectorate (ILT) monitors compliance with the ban on free plastic bags. It checks sales outlets and conducts administrative inspections. Shopkeepers must be able to demonstrate that they are not giving plastic bags away free of charge. Violations of the ban on free plastic bags may be reported to the ILT. Letter to the Chairperson of the House of Representatives about tackling carrier bags (including free plastic bags).